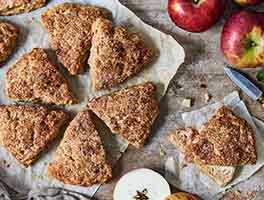 Whole spelt flour, milled from an ancient wheat variety, makes scones with wonderful grain-y flavor. 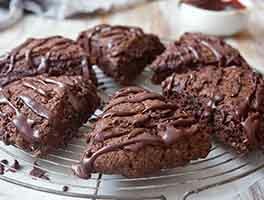 Dark chocolate adds just the right amount of sweetness to these scones, which are more British-style than American: robust yet nicely crumbly; not too sweet yet full-flavored. This recipe comes from Wisconsin farmers John and Halee Wepking, who grow the spelt they typically bake with. They're proud members of the National Young Farmers Coalition. Preheat the oven to 350°F, and toast the sunflower seeds until they're fragrant, but haven't taken on much color; this will take 5 to 7 minutes. Remove the sunflower seeds from the oven, and let them cool while you start the scone dough. Stir in the cooled sunflower seeds and chopped chocolate. In a separate mixing bowl, whisk together the eggs, milk, and vanilla. Add the liquid ingredients to the dry ingredients, and gently/quickly mix everything together, just until you've made a cohesive dough; your hands are the best tools here. Line a baking sheet with parchment; if you don't have parchment, just use it without greasing it. Sprinkle flour atop the parchment or pan; use just a little bit if your dough is fairly "workable," more if your dough is soft and sticky. Scrape the dough onto the floured parchment or pan, and round it into an 8" disk a scant 1" thick. Brush the dough with milk. Using a knife or bench knife that you've run under cold water, slice it into 8 wedges. 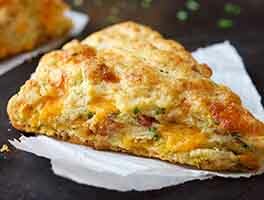 For best texture and highest rise, place the pan of scones in the freezer for 30 minutes, uncovered. While the scones are chilling, preheat the oven to 425°F, with a rack in the upper third. Bake the scones for 25 to 30 minutes, or until they're golden brown. When you pull one away from the others, it should look baked all the way through; the edge shouldn't look wet or unbaked. Remove the scones from the oven, and cool briefly on the pan. Serve warm. When they're completely cool, wrap in plastic and store at room temperature for up to several days. Freeze for longer storage. 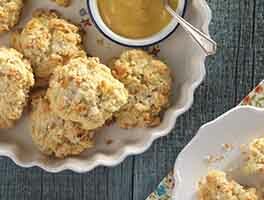 These scones can be baked in our ceramic scone pan; however we don't recommend freezing them in the pan before baking. Simply bake the scones as soon as you've cut and put them into the pan; the cold milk and butter will help provide flakiness. Delicious! I milled the spelt with Nutrimill I bought from KAF. I didn't find mine overbaked at about 20 min. I didn't bother separating and pulling apart like the instructions said. I just cut and left in a circle. I baked on a Silpat and didnt do anything to it but put the dough on it. They came apart just fine after baking and cooling. I also cheated and bought already roasted unsalted sunflower seeds. Thanks- please give us more great fresh mill recipes. Just made these scones with spelt flower I purchased from King Arthur. 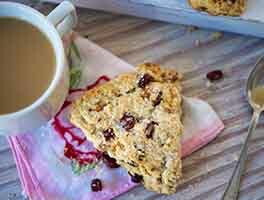 I enjoyed reading the blog written by the originator of these scones who is a organic farmer in my home state of Wisconsin. The scones were delicious with a fragrant light wheat aroma from the spelt. I added some strawberry jammies to just give it a lift with the chocolate. I'm glad I read the other reviews b/c I did freeze first and then pulled scones apart to bake. I also baked only 16 minutes and they were already starting to over-brown on top but were perfectly baked inside. Can't wait to eat another one tomorrow morning with my coffee. To reduce frustration, reverse steps 10 and 11. Once chilled, the scones will separate cleanly. Tasty but overbaked at 18 min. Wow! This turned out super. Goes really well with a glass of milk. I used coconut sugar instead of regular and 100% pure dark Peruvian chocolate. Thank you KAF. Your recipes turn out fantastic the first time around and that is exceptional!